I do deClaire: To the Max! Well Claire I made it through the weekend just fine. Claire really enjoyed her time with my parents and there are so many cute, happy pictures of her! I can't say I enjoyed my weekend as much as she did, but we some work around our house done. Like all 12 cubic yards of that mulch spread. See we have a row of pine trees in our backyard and nothing grows under them. Well nothing but weeds. I tried to section off the area years ago with rocks and plant some hostas, but it didn't work. The weeds were 6 feet tall. It was ridiculous (and embarrassing). I think our neighbors hated us. I'm really glad we don't have a Home Owners Association to fine us or anything! Last summer I finally did a thorough job of cleaning up the area and we put the weed block cloth down. Now it's finally covered and we have a respectable back yard! See how else I've worn my denim jacket here. WOW Nice Yard!! Excellent work, my friend!! love this maxi!! and the yard looks so good. I have my eye on the short sleeve version of that maxi, but it looks really long on you and I have always been under the impression that you are pretty tall! Nice job on the yard, I could never have managed that in one weekend! I love how you belted this look! Well it helps when your husband does not live overseas for most of the year anymore right ;) Looks great! But of course you know I drool over your home, weeds and all! I really like how you did your yard! We haven't done much if any yard work since we moved in 2 years ago. I hope ours don't hate us either! I really like how you styled your dress! I really love your necklace and leopard-print belt! Oh how cute! 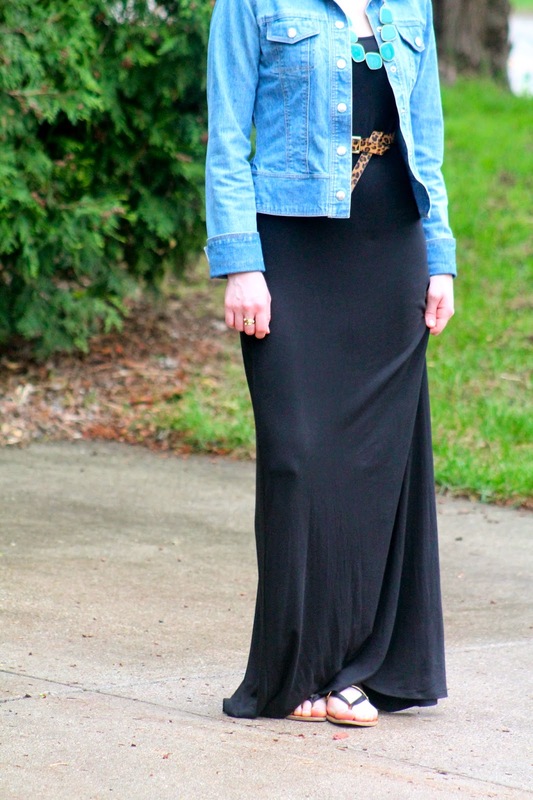 I love the leopard belt with this maxi and the denim jacket too! Super cute maxi- and so remixable! And holy mulch! That's a lot of work! Hopefully the mulch will last through two springs so you don't have to do it over next time? It looks fantastic! Cute maxi and yay for getting the yard done, looks great! This is half of the mulched area of our yard. Everything around the house we did last year so hopefully we can do each area every other year. :) At least we can get it done in about a day if we work together! I love how you made a black maxi so fun and unique with a few accessories. Pretty! Congrats on your yardwork achievements--I've had trouble with pesky weeds in years past as well! I love the belted maxi! It's such a good idea. Good job on the yard. Such a great look. So put together! Love love love a black maxi! You styled yours so fabulously!